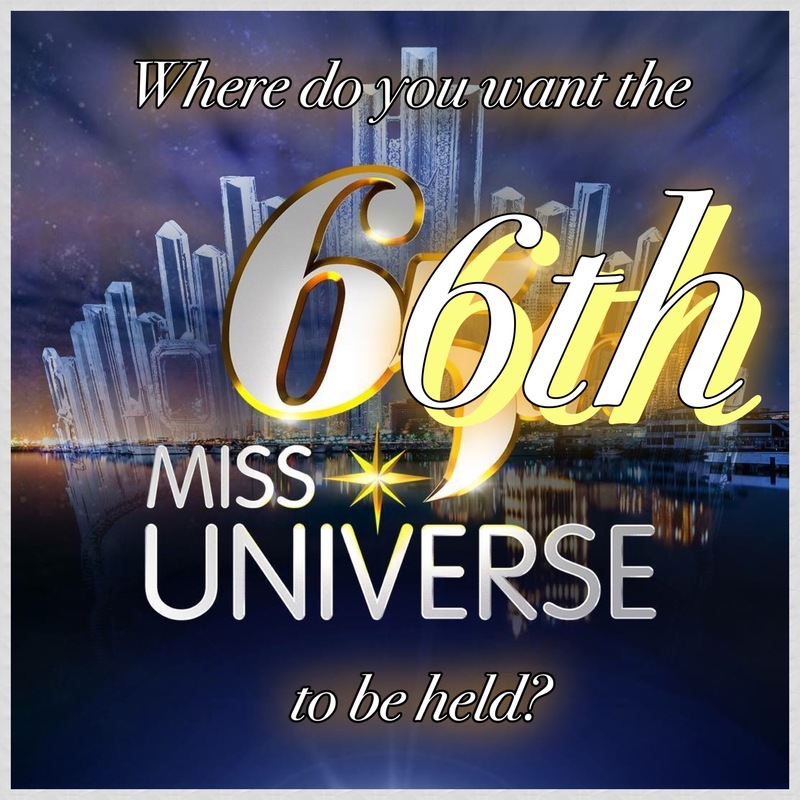 Where do you want the 66th Miss Universe to be hosted? Posted in: 1 Pageant Pages, 2 Shout-out-Looks. Tagged: 65th Miss Universe, 66th Miss Universe, Festival du Cannes, Iris Mittenaere, Jean Paul Gaultier, WME/IMG. As we look at photos of Miss Universe Iris Mittenaere during her walk at the red carpet of the 70th Festival du Cannes wearing Jean Paul Gaultier and Messika jewelry, let’s go on a not-so-whimsical post about the possible host country of the 66th Miss Universe. Initially, as in very late last year, rumors floated that Australia is interested in bidding to organize the next edition – right about the same time that the Philippines sealed the deal to tale charge of the 65th. And then, the talks died down without much funfare. After that, there were sound-offs online for Indonesia being considered for the job as well. And this is not such a remote possibility since the Miss Universe Organization maintains a good relationship with our Southeast Asian neighbor – with the reigning titleholders regularly crowning their Puteri Miss Indonesia (except Pia) and making a commercial for that Vitamin C drink. There has been no progress in this part as well. Somewhere in between, the possibility of bringing the pageant to Europe also became a topic of discussion by many, with Paris as potential focus with Iris as the current winner. But that did not see much of a wildfire effect. So next in line would be the default host country of our favorite beauty pageant – the US. It could be Las Vegas or Los Angeles depending on where WME/IMG can wield its clout more effectively. And holding it in either cities would augur well for Miss Universe Philippines 2017 Rachel Peters considering the strong Fil-American support. This remains as a more stable option. But there are also those who say that the 66th will return to the Philippines. The prospects of this happening are not very exciting on my part as an accredited media partner because it is way too soon to host again. Besides, the last edition was such a tough act to follow given the kind of overwhelming support given by the sponsors, organizers and practically the entire nation. But the commitment to do everything all over again is much of a stress-inducer to take with open arms. Posted in: 1 Pageant Pages, 2 Shout-out-Looks. Tagged: Miss Universe, UFC, WME/IMG. When Inquirer.net posted the entry above, the question behind the Miss Universe hosting of the Philippines became a hotter topic, moreso that WME/IMG has also been reported as pulling out of the UFC event to be hosted here. So instead of coming up with a long list of speculations if MU is a go or no go, let us wait for an official statement from Miss Universe Organization and the Philippine counterparts. A lot has been said – political instability, inability to raise the required hosting fee and even the tangled conditions that the major (casino) financiers are imposing but could not be guaranteed. You can discuss. But until a big Press Release is finally uploaded or announced by those in the position to do so, the answer will always be uncertain. Posted in: 1 Pageant Pages, 2 Shout-out-Looks. Tagged: Deshauna Barber, Miss Universe 2015, Miss Universe Organization, Miss USA 2016, Pia Wurtzbach, WME/IMG. So now that Olivia Jordan has made the beautiful exit as Miss USA 2015, her successor Deshauna Barber started taking over the reins as the country’s next Miss Universe rep. Along with Miss Universe Pia Alonzo Wurtzbach herself, the two departed on a private plane to the Big Apple where they will start living together as housemates in the appointed Manhattan apartment and continue with their respective responsibilities for WME/IMG. 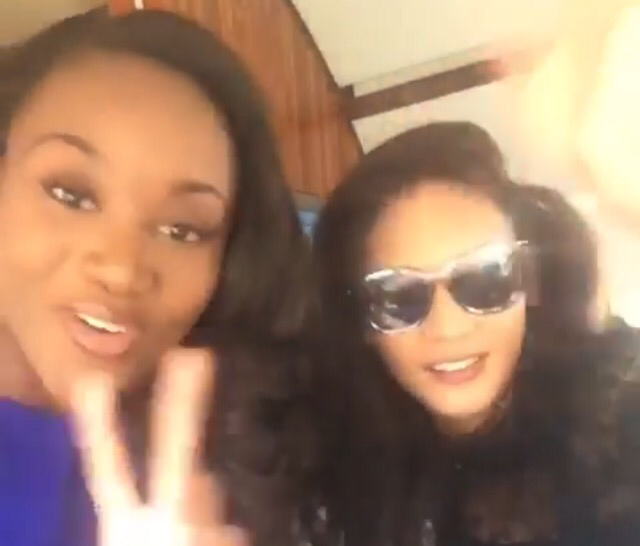 Will Pia and Deshauna hit it off well? I think so. While some people are saying that their strong personalities might not compliment each other, the adjustments shouldn’t be that big considering that they are expected to fulfill important roles in the Miss Universe Organization. They will nicely blend soon enough. Laura Lehmann: The right time to re-join Bb. Pilipinas? Posted in: 1 Pageant Pages, 2 Shout-out-Looks. Tagged: Bb. Pilipinas 2016, Laura Lehmann, WME/IMG. Could 2016 be the right time Bb. 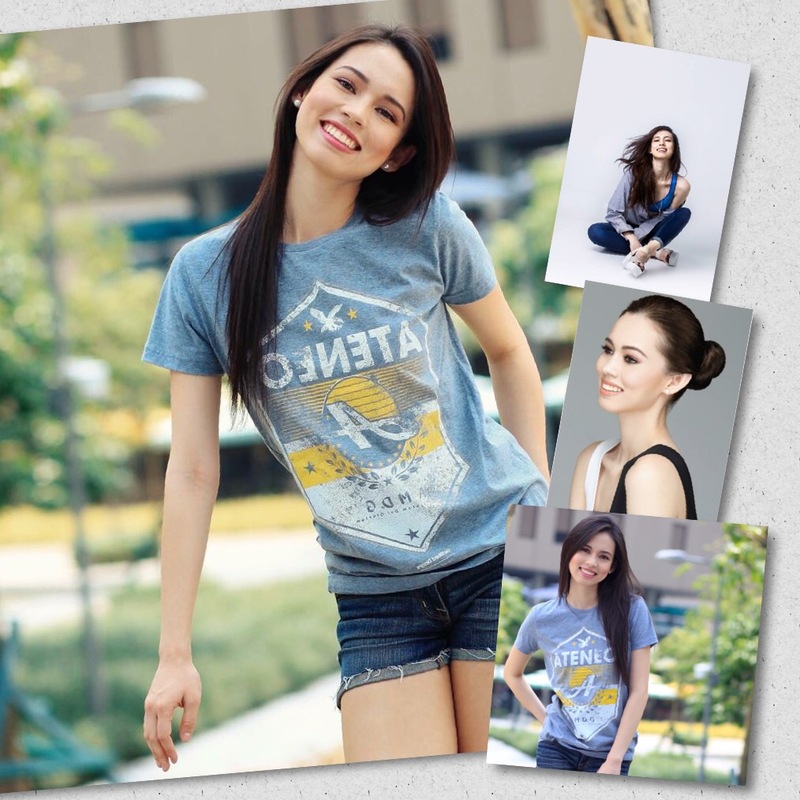 Pilipinas for Laura Lehmann? One of my blog’s regular readers engaged me in a chat that really piqued my curiosity. I must admit that I still haven’t looked at the connection right away, and even considered it a remote advantage in a way. But you all know that my favorite girl Laura Victoria Lehmann is half-American. And that part of her lineage is actually Jewish. 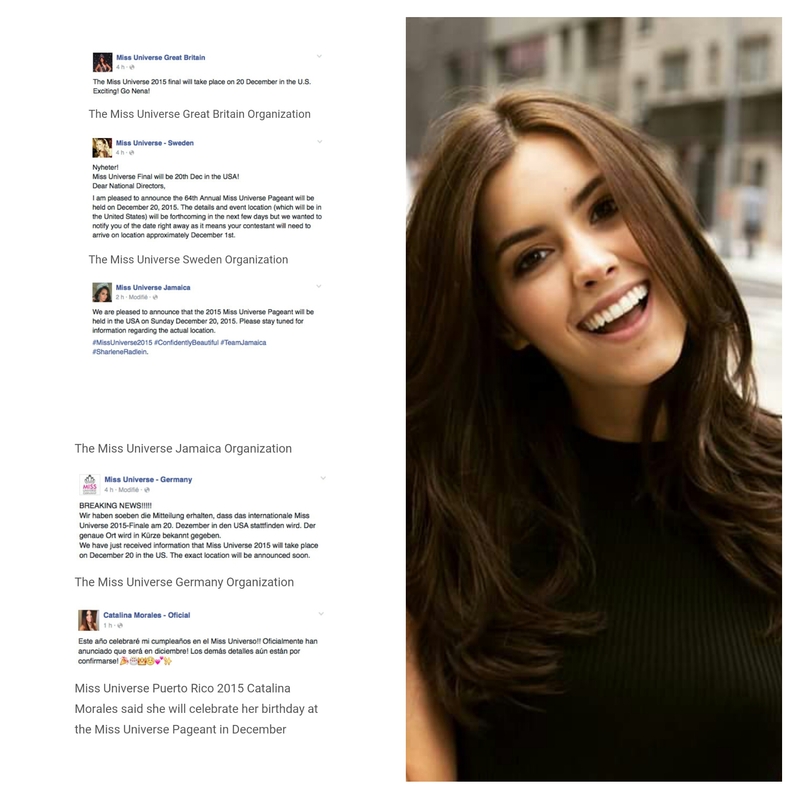 And the new owner of Miss Universe – WME/IMG’s Ari Emmanuel – is Jewish. So logic dictates that sending someone like Laura could be advantageous in terms of going for a back-to-back win in Miss Universe. Crazy idea? I’ll take the potshot alright. But if you really try to look at things from that standpoint, it doesn’t sound far-fetched at all. Of course, someone would oppose by saying that the next Miss Israel could even be 100% Jewish so why not favor her? Hmmmm. Anyways, regardless of the connection, I always see Laura as having the right ingredient to win big in the nationals should she try joining for a 2nd time. After placing 1st Runner-Up last year, she could be ripe for the picking for 2016. And more polished, I might add. She is now a trained Sports Commentator so the natural elements of speaking in front of the camera are already in place. And besides, the natural charm has never been lost. It got stronger even. Will Laura’s Jewish connection by blood be an advantage for Miss Universe Philippines? This is it, folks! This is really it! Posted in: 1 Pageant Pages. Tagged: Miss Universe 2015, Pia Alonzo Wurtzbach, Planet Hollywood Resort & Casino, WME/IMG. The announcement you’ve been waiting for! This is the cherry on top of the sundae. The Official Announcement from Miss Universe, if you will. 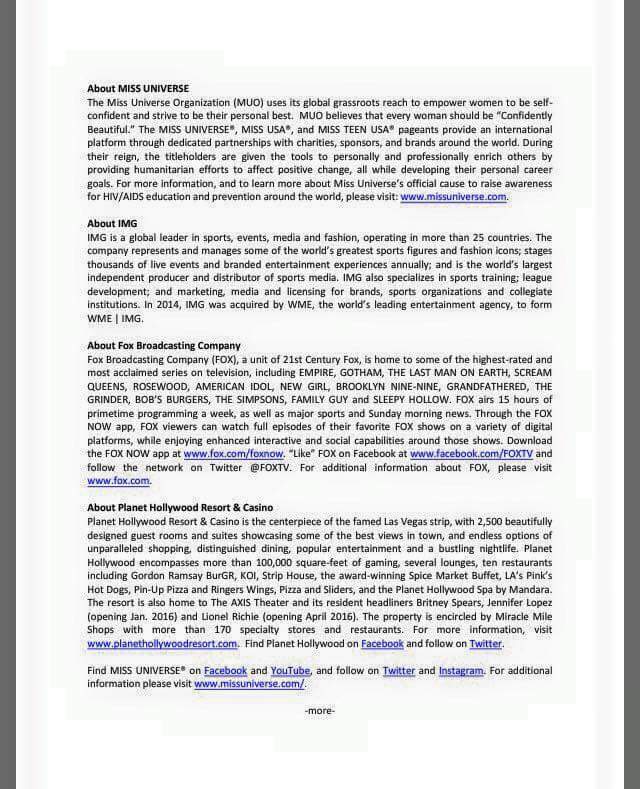 Our favorite beauty pageant will definitely be on December 20 at Planet Hollywood Resort and Casino in Las Vegas. Start booking your flights. Begin searching for the best hotel rates. Because the lowest-priced ones will run out very soon. 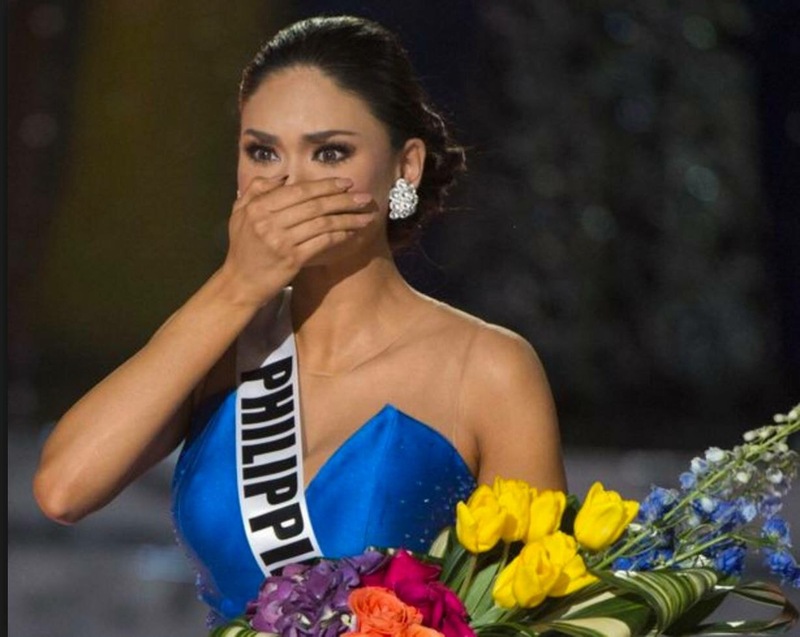 And Miss Universe Philippines 2015 Pia Alonzo Wurtzbach must really be ecstatic by now. Posted in: 1 Pageant Pages, 2 Shout-out-Looks. Tagged: Miss Universe 2015, Pia Alonzo Wurtzbach, WME/IMG. Everybody is already saying it,except the new owners themselves. Pageant News has posted about it. Even National Directors from different countries have released breaking-news mention of the same. Miss Universe 2015 will be hosted in Las Vegas on December 20. I really wonder why WME/IMG is allowing everyone else to jump the gun on them. After all, they have the final say on the details. Posted in: 1 Pageant Pages, 2 Shout-out-Looks. Tagged: Miss Universe, Pia Alonzo Wurtzbach, Raymond Saldana, WME/IMG. With the evolving thrust of Miss Universe under the new management of WME/IMG, our Miss Universe Philippines 2015 Pia Alonzo Wurtzbach is also starting to channel her inner Top Model beginning with the latest Raymond Saldaña photograph above. And with her significantly sexier and fitter body (see left photo) to boot, her overall appeal can only get better and fiercer.